Rarely Available - 1st Floor - Gorgeous, Upgraded Lakefront 3 Bedroom, 2 Bath Condo with attached garage. This beautiful and well maintained condo has many fabulous upgrades including: New Tile, New AC, New Appliances, Newly painted and upgraded lighting and fans. Open floor plan. New Roof will be added soon. 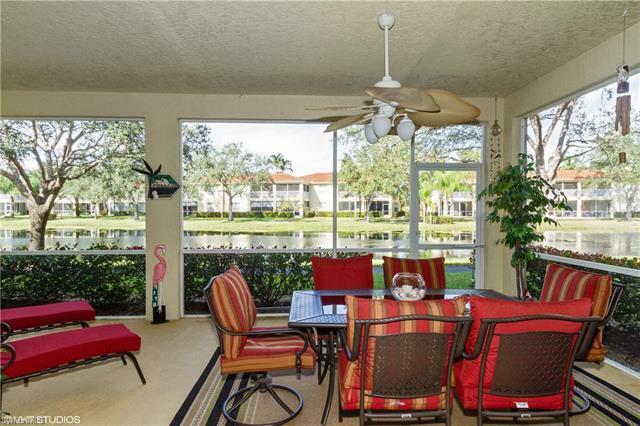 Enjoy tranquil moments on your huge lanai with stunning and breathtaking lake views. Diamond Lake is a centrally located gated community of 88 carriage homes with great amenities - Large Heated Pool, Bocce Courts and a Clubhouse that includes a small library, community room and an exercise area. Short Walk to the pool and Enjoy the walk around the lake on the landscaped walking path. Location, Location - Across from Sam's Club and it is minutes away from the beaches, restaurants, shopping, hospitals and much more. Great school district. Call for details. © 2019, The data relating to real estate for sale on this Website come in part from the Broker Reciprocity Program (BR Program) of M.L.S. of Naples, Inc. Properties listed with brokerage firms other than The Roy Group Real Estate Services are marked with the BR Program Icon or the BR House Icon and detailed information about them includes the name of the Listing Brokers. The properties displayed may not be all the properties available through the BR Program. BR data on this website is provided by The Roy Group Real Estate Services on behalf of David Roy. The source of this real property information is the copyrighted and proprietary database compilation of the M.L.S. of Naples, Inc. Copyright 2006 M.L.S. of Naples, Inc. All rights reserved. The accuracy of this information is not warranted or guaranteed. This information should be independently verified if any person intends to engage in a transaction in reliance upon it. Data last updated 2019-04-18 18:30:37.